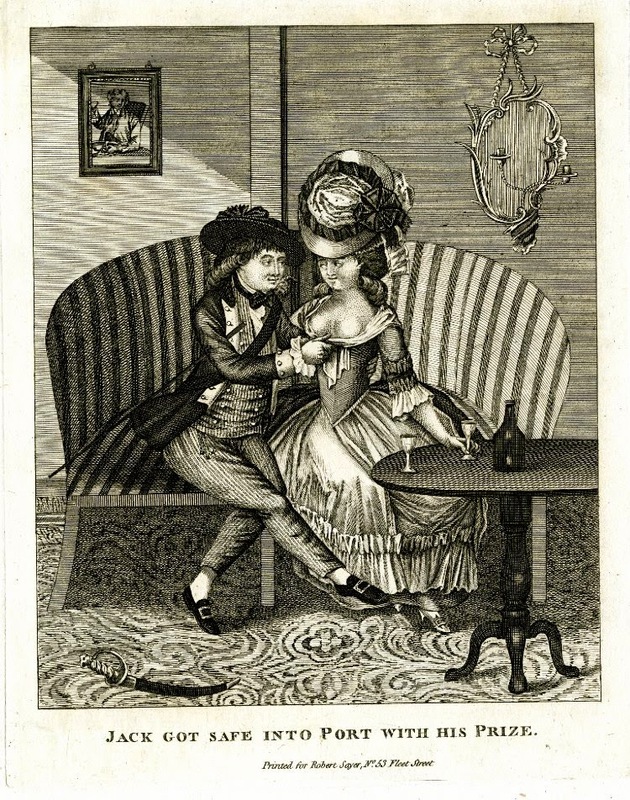 Sayer's print of a sailor courting a woman (likely of ill-repute) is so cliche, I hadn't even realized that I had not yet covered it on this blog. On closer inspection, there are a few very interesting tidbits we can draw from an otherwise common image. The first is the print in the background on the left. If you have followed my blog in the past, you may recognize that as the Carington Bowles' print "The Sailor's Pleasure." Bowles meant that title to refer to tobacco, rum punch, and prize money, Sayer has an entirely different interpretation. 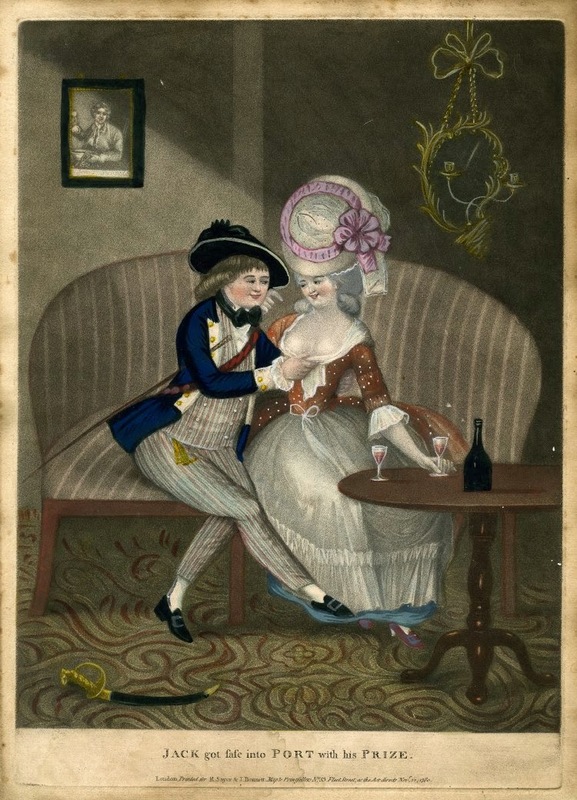 Jack reaches not for a glass, as the lass does, but rather for her chest. The other interesting aspect of this print is that it exists in many different versions. Uncolored prints, as this version from the British Museum, are not uncommon of prints during the period. Bowles, Sayer, and others would offer the colored versions for a slightly higher price, but both could be easily obtained. Occasionally museums will own copies of both colored and uncolored prints, but it is not very common for them to possess both those and a knock-off. This poorly etched version, printed, colored, and sold by an unknown source, is a clear rip-off of Sayer's print above. In every version, Jack wears a round hat, and in Sayer's piece it has a large bow. The knock-off gives it a large feather of some sort. In both versions the sailor wears a short blue jacket with lapel, though Sayer's gives him white lapels, rather than a sloppily painted solid color. Sayer also gives the jacket what are clearly brass buttons. In both versions he wears a striped waistcoat and striped trousers, and in each the waistcoat is double breasted. Under his arm is always tucked a cane or stick. 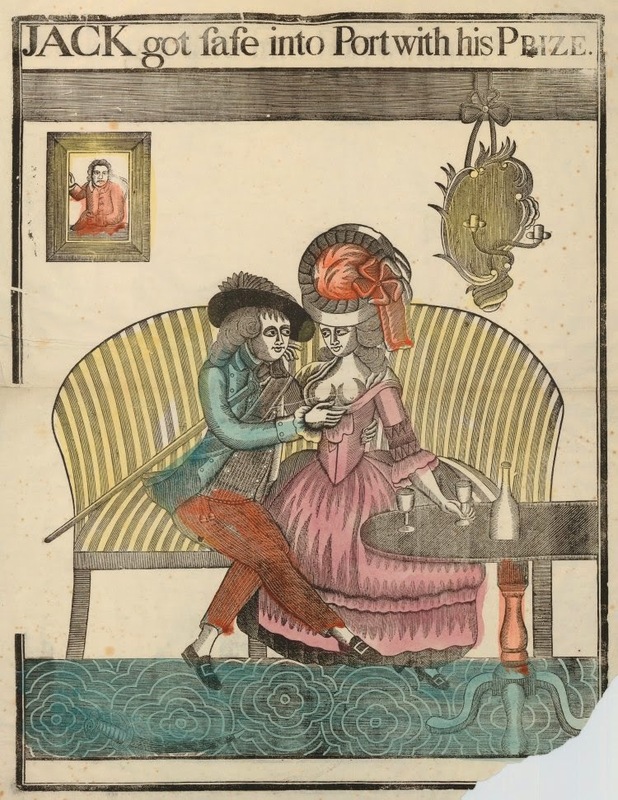 Sayer and his plagiarist both give the sailor a black bow at his throat, rather than the typical loose neckcloth. EDIT: Buzz Mooney points out that an added benefit of having both the colored and uncolored version of Sayer's print is that we can see what embellishments were added (and which weren't) by the colorist. Sometimes, when we only have access to the colored version of a print, there are touch-ups that can change the image. In this case, it could have been possible for the colorist to add stripes to the waistcoat and trousers. With both versions, however, we see that the stripes had been there all along and were fully intended by the engraver.